Snowbee Diamond² Fly Rods - Since 1994 the name ‘Diamond Fly’ has been synonymous with Snowbee and has built a loyal following. 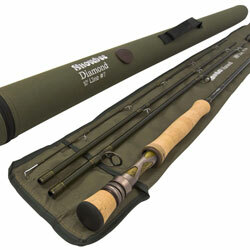 Since then, the Diamond Fly Rod range has steadily evolved, to today’s range which incorporates the very latest thinking in fly rod design and material technology. The Snowbee Diamond² Fly Rods retain the same crisp, middle-to-tip action of their predecessors and still represent exceptional value for money for a rod of this quality. Using Snowbees well-tried ‘Tri-modulus carbon’ technology to produce a blank that is fast, crisp and light. These rods compete on performance with many of the best on the market, but are infinitely more affordable. Using the best quality materials available Snowbee spared nothing in producing the best looking, best fishing 4-piece fly rods they could achieve at this price. The range has been designed with a particular fishing application in mind. In addition to river, small stillwater and reservoir rods, there is also longer, lower line weight models, appealing to river fishers who favour the lighter Eastern European and Czech nymph styles of fishing. Finished in a lustrous deep olive colour, with self-colour whippings, subtle gold graphics and brushed aluminium reel seats, with olive green burl wood insert complementing the colour of the blanks. Combine all of these and you have a rod with classic and timeless appeal.